From Hungry Refugee Kid To Prize-Winning Quinoa Farmer : Goats and Soda As a kid, Cedric Habiyaremye used to go hungry living in a refugee camp. Now, he's an aspiring plant scientist hoping to bring nutrient-rich crops to his country. 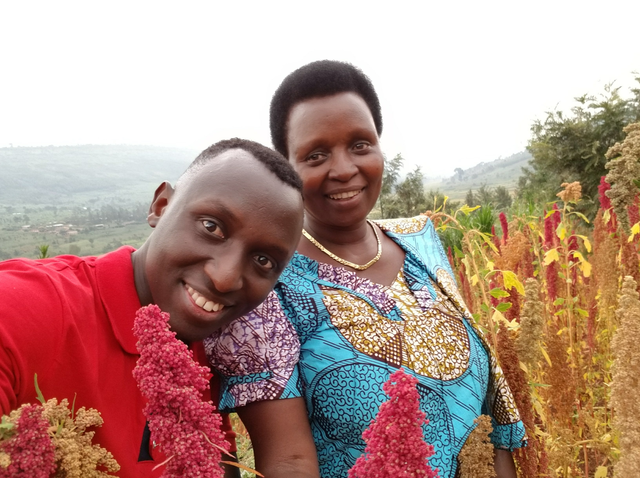 Cedric Habiyaremye and his mother on a quinoa farm in Rwanda. This month, he won the World Hunger Leadership Award. Organized by North Carolina State University and a nonprofit group called Rise Against Hunger, the award is given to a rising young star in the field of global agriculture. 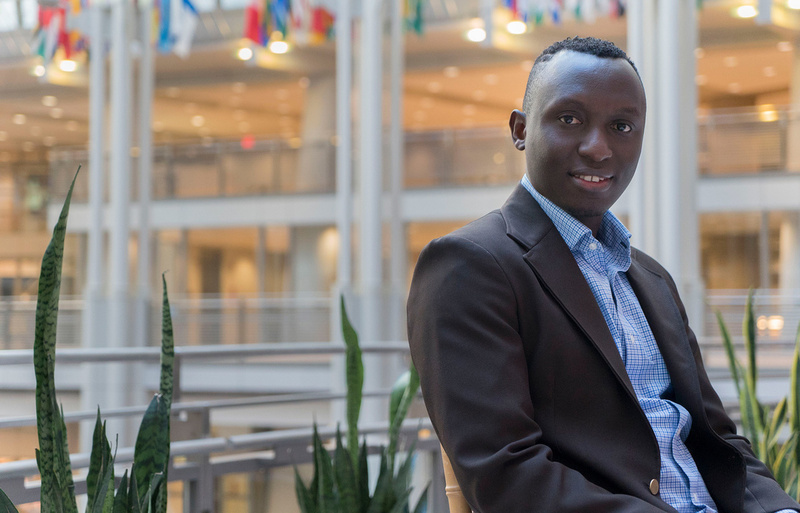 Habiyaremye, 31, is part of the Sustainable Seed Systems Lab at his university, where he conducts research on alternative crops like quinoa, millet and amaranth. He also leads a project in Rwanda, Uganda and Kenya to encourage local farmers to grow quinoa. Since the crop is easy to grow and packed with protein, Habiyaremye hopes it can provide new nutritious food sources in the region. NPR spoke with Habiyaremye last week, when he visited Washington, D.C., for an agriculture conference hosted by the Chicago Council on Global Affairs. This interview has been edited for length and clarity. You have faced incredible hardship in your life. You lost your father when you were 11 during Rwanda's civil war. Then you, your older brother and mother fled to a refugee camp in Tanzania. What was life like at the camp? We were desperate. Hopeless. There were times when we didn't eat for two or three days. You almost gave up hope, but your mom lifted you up. One day, when I was 11, she saw that me and my brother were desperate. She said, "This is not the end of your life. This is not the end of the world. You are the future of this country." My reaction wasn't good. She was saying those strong words, but it seemed abstract. I left the room and sat outside by a tree and I cried a lot. My brother came to me and said, "Maybe mom is right, let's wait and see." That's when you knew that you wanted to study agriculture. I wanted to go to school and learn how to produce enough food to not go to bed hungry. Now I'm a Ph.D. student. Imagine! From nothing! Well, you had a little cash from your candy business, which helped you pay for books and supplies for school after you returned to Rwanda after three years at the camp. It started with 25 cents. When I was in elementary school, I knocked on people's doors to borrow money for a loan. Finally a woman gave me some. I used that 25 cents to buy candy, which I sold for a profit. The principal allowed me to sell the candy at school. And so I managed to return to that woman's door and give her back her 25 cents. She said, "How did you make that money!" And I said, "You don't want to know." A big part of your work today focuses on encouraging mass production of quinoa in Africa, which you are doing in partnership with Washington State University. Why quinoa? In Rwanda, a lot of families don't have access to protein. As a result, there's high rates of stunting. Quinoa is a complete protein. It can grow in bad climate and soil but still give a good yield. It's not. It's originally from South America. And it's a hipster food here in the U.S.! So how did you know which quinoa seeds to grow in Africa? In Rwanda, for example, I sent 20 different varieties of seeds to be tested. We tried to see which varieties would grow best in Rwanda's three zones: highland, central plateau and eastern lowland. The results were good. Of course there were some varieties that didn't respond. Habiyaremye in Washington, D.C., in March for an agriculture conference organized by the Chicago Council on Global Affairs. Then you gave some of those seeds to your mom. I wanted to hear her impression of quinoa so I could see how to navigate [its adoption] with other farmers. I gave some seeds to her. She grew it in her backyard, harvested it. And she loved it! She loved it to the point that she started selecting different good-quality seeds and growing those. Then she tried to cook it in ways that are similar to traditional Rwandan foods. She boils it and mixes it with rice, or she turns it into flour to make quinoa bread. Or she makes quinoa salad, or mixes quinoa with beans. She also makes different fermented quinoa drinks, like what we [Rwandans] do with sorghum. And quinoa porridge. When she serves it to friends, they love it. And now she asks me, "I'm running out of seeds, do you have more?" Last time, I gave her more seeds so she could give some to her friends. How did her reaction help you with your quinoa project? I want to let the farmers be advocates for quinoa, not me. We have five provinces in Rwanda. I have at least three farmers representing each province. They were trained to grow quinoa, harvest it and cook it. There are a small number of people who know about it and appreciate it. And they're gradually telling others about it. You've come a long way from the refugee camp. To me, it validates what my dad taught me: Never give up on your dreams. Because when you believe in those few dreams, they become true.